This timeless and charming design is the last sweet touch every nursery needs. 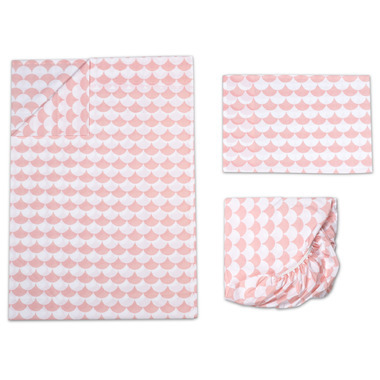 The Lolli Living Toddler Sheet Set is complete with one flat sheet, one fitted sheet, and one pillowcase. Lolli Living's sets embody the charm and imagination of childhood through lively, trend-conscious designs. Your child will sleep peacefully with our snuggly soft, 100% cotton sheets. Fitted Sheet: 52" x 28" x 7.5"
Flat Sheet: 45" x 65"